All ranges and cook tops require minimum clearance to combustibles (materials that fail to conform to ULC Standard CAN4-S114), whether the heating source is electric or gas. The Ontario Building Code (OBC) section 9.10.21 (Fire Protection for Gas and Electric Ranges) indicates that gas and electric ranges require the same clearance to combustibles. The Gas Code goes one step farther and insists that gas appliances be installed to the manufacturers certified installation instructions and appliance rating plate. Therefore the clearances for the installation of gas ranges and cook tops are specified by the actual appliance and often exceed the OBC. Framing, finishes, and cabinetry installed directly above the location of the range shall not be less than 30" above the level of the electric or gas range burners or elements. This vertical clearance can be reduced to 24" with the addition of 1/4" flame retardant millboard, covered with sheet metal of at least 0.013" thickness. Framing, finishes, and cabinetry installed within 18" of the area where the range is to be located shall be protected above the level of the heating elements by material providing fire resistance not less than that of 3/8" thickness of gypsum board. Framing, finishes, and cabinetry located on each side of the range shall be 18" minimum above the level of the heating elements. The diagram below shows required clearance to combustibles for a typical residential gas range. High power pro type ranges must be looked at individually as their clearances are often much larger (e.g. in some cases directly above the cook top: 48" instead of 30", "D" in the diagram below). 5" (12.7 cm) minimum clearance from both sides of the range, above the cooktop level, to the side wall or other combustible material (for example light valances). **NOTE 24" (61 cm) minimum when bottom of wood or metal cabinet is protected by not less than 1/4" (0.64 cm) flame retardant millboard covered with not less than No. 28 MSG sheet steel, 0.015" (0.4 cm) stainless steel, 0.024" (0.6 cm) aluminium or 0.020" (0.5 cm) copper. 30" (76.2 cm) minimum clearance between the top of the cooking platform and the bottom of an unprotected wood or metal cabinet. 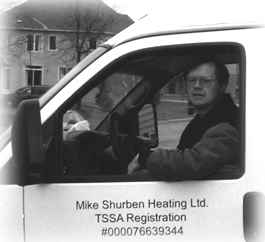 The appliance industry is well regulated and all appliances sold in Canada must be approved by a recognized regulatory body. As part of the appliance approval, the installation instructions for an approved appliance are also certified by the regulatory body. The Gas Code requires the certified installation instructions to be followed to maintain safe installations with respect to fire and appliance overall safety. See Certification marks for Canada at the CSA site. Many builders (and kitchen cabinet manufacturers) are providing under cabinet lighting; and hide the lighting with combustible valances around the bottom of the upper cabinets. If this is done for a gas range installation the cabinets must be installed so that the light valances are 18" above the counter top surface or the light valance must start with a setback from the edge of the range or cook top by the clearance given for "L" in the diagram above. A typical valance setback is shown in picture below. See also Building Code Commission ruling No. 03-04-902 concerning light valances in the area of range installations. While gas ranges are approved for direct venting into the home, the ventilation code for newer homes requires a range hood of at least 100 cfm (cubic feet per minute) exhausting capacity to be installed above a standard 30" gas range or cook top. New homes containing combustion appliances also require carbon monoxide (CO) detectors, but many older homes do not have CO detectors. While today’s gas ranges and cook tops are very clean burning, there is a lot of moisture and some combustion byproducts that are best vented directly outside. Therefore range hoods should be used and CO detectors installed for the safest appliance operation. 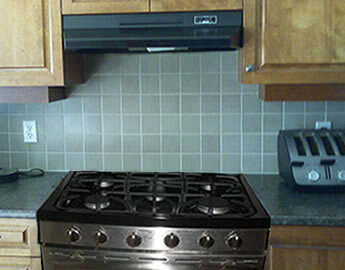 When looking to remodel your kitchen and a gas range or cook top is part of the new kitchen design, make sure your contractor and cabinet manufacturer have your range installation instructions so that proper clearances can be designed into the new kitchen. Even if you haven't physically had the range delivered, most installation instructions are available from the various manufacturers Web sites. There is no reason to not design it properly from the start. That being said, be generous with spacings around your range. It doesn't look that bad to have a 36" or 42" range hood above your 30" stove. Remember that installation instructions are the minimum requirement. A little more space allows future appliance swaps, without clearance issues. 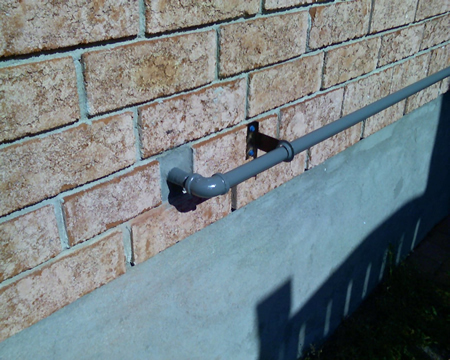 The following images show a difficult installation where the pipe entry location had to be manipulated due to obstructions within the wall. 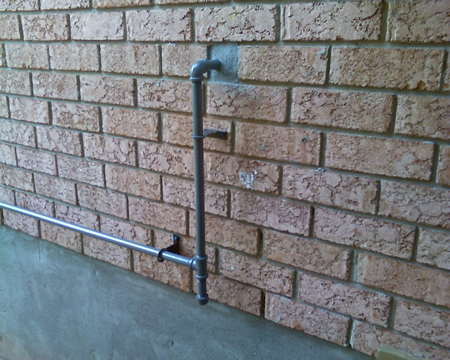 You can see the attention I paid to keeping the exterior of the home and brickwork as neat and visually pleasing as possible, while ensuring the stability of the piping.